Bhubaneswar: The State Government on Saturday hiked Gram Rozgar Sevaks (GRSs) wages by Rs 2,000. This was announced by Pachayati Raj Minister Pradeep Maharathy here. The GRSs had been agitating pressing for fulfilment of their five-point charter of demands including increasing their wages; and when they had tried to march from Master Canteen Square towards the State Assembly, a scuffle took place between them and the police. Later, the police had resorted to the lathicharge to disperse the protestors in which many were injured. But Union Minister Dharmendra Pradhan alleged that the announced wage hike is insufficient and alleged that Chief Minister Naveen Patnaik has become insensitive towards the plight of people. Pradhan said, “In a democracy, lathicharge or any form of violence against peaceful protestors is offensive. 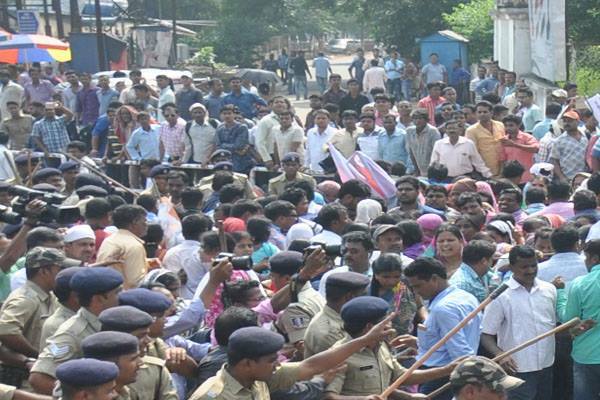 The way police personnel behaved with the activists and even manhandled the women agitators raises grave concerns over the inhuman approach and insensitiveness of the authorities,” said Pradhan. However, Minister Maharathy in his reaction said, the BJP is trying to instigate the GRSs. His doors are open for the protestors’ leaders and they can come and discuss with him. He is not their enemy.